I remember when I first started watching tutorial videos on mixing. These hot shot mix engineers would pull up their tracks and start showing how they used this compressor or that channel strip. But as I listened, I would start to tune out. So I bumble on through the interwebs, watching video after video, trying to find someone to teach me how to make my tracks sound professional. The problem here is that I was COMPLETELY missing the problem. I was like an ER doctor who prescribes ibuprofen to a guy who walks in with a tire iron sticking out of the back of his head. It makes me think of that verse in the Bible about trying to remove a speck from someone else’s eye while you still have a massive plank in your own eye. I thought the problem was my mixing skills. I thought I needed to learn more voodoo magic ninja mixing tricks to make my mixes sound professional. The truth, however, was much more simple. My mixes sounded bad because my recordings sounded bad. I was too busy ridiculing the professional mix engineer with his amazing-sounding tracks to realize that I would NEVER have similar results if I didn’t focus on making MY tracks sound amazing…BEFORE I start mixing. 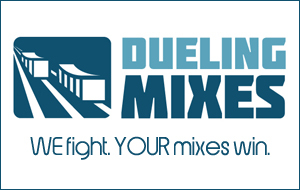 That’s one of the biggest lessons our Dueling Mixes members are learning every month. They’re getting raw tracks of really well-recorded songs. Even thought most of the tracks were recorded in home studios just like theirs, they’re starting to see how they need to focus their energies on improving their recording skills AS WELL AS their mixing skills. And we’d love to help you out. Get started today, and you can hear first-hand how Graham Cochrane recorded a full-band song in his one-bedroom home studio.